December 31, 2017, the last business day of the registrant’s most recently completed second fiscal quarter, was approximately: $1,195,743,546. Documents incorporated by reference — Certain information required for Part III of this report is incorporated herein by reference to the proxy statement for the 2018 annual meeting of the Company’s shareholders, expected to be filed within 120 days after the close of our fiscal year. MSG Networks Inc., incorporated on July 29, 2009, is a Delaware corporation with our principal executive offices at 11 Pennsylvania Plaza, New York, NY, 10001. Unless the context otherwise requires, all references to “we,” “us,” “our” or the “Company” refer collectively to MSG Networks Inc., a holding company, and its direct and indirect subsidiaries through which substantially all of our operations are conducted. Our telephone number is 212-465-6400, our Internet address is http://www.msgnetworks.com and the investor relations section of our website is http://investor.msgnetworks.com. We make available, free of charge through the investor relations section of our website, annual reports on Form 10-K, quarterly reports on Form 10-Q and current reports on Form 8-K and amendments to those reports filed or furnished pursuant to Section 13(a) or 15(d) of the Securities Exchange Act of 1934, as amended (the “Exchange Act”), as well as proxy statements, as soon as reasonably practicable after we electronically file such material with, or furnish it to, the Securities and Exchange Commission (“SEC”). References to our website in this report are provided as a convenience and the information contained on, or available through, our website is not part of this or any other report we file with or furnish to the SEC. On September 30, 2015 (the “Distribution Date”), the Company distributed to its stockholders all of the outstanding common stock of The Madison Square Garden Company (“MSG”) (the “Distribution”). In the Distribution, each holder of the Company’s Class A common stock, par value $0.01 per share (“Class A Common Stock”), of record as of the close of business, New York City time, on September 21, 2015 (the “Record Date”), received one share of MSG Class A common stock, par value $0.01 per share, for every three shares of the Company’s Class A Common Stock held on the Record Date. Each holder of the Company’s Class B common stock, par value $0.01 per share (“Class B Common Stock”), of record as of the Record Date received one share of MSG Class B common stock, par value $0.01 per share, for every three shares of the Company’s Class B Common Stock held on the Record Date. Following the Distribution, the Company no longer consolidates the financial results of MSG for purposes of its own financial reporting and the historical financial results of MSG have been reflected in the Company’s consolidated financial statements as discontinued operations for all periods presented through the Distribution Date. The Company, an industry leader in sports production, and content development and distribution, owns and operates two award-winning regional sports and entertainment networks, MSG Network (“MSGN”) and MSG+, collectively “MSG Networks.” For nearly 50 years, we have been a pioneer in regional sports programming, setting a standard of excellence, creativity and technological innovation. Today, our exclusive award-winning programming continues to be a valuable differentiator for our viewers, advertisers and the cable, satellite, telephone and other platforms that distribute our networks (“Distributors”). Our networks are widely distributed throughout all of New York State and significant portions of New Jersey and Connecticut, as well as parts of Pennsylvania, collectively our “Regional Territory.” Our networks are also carried nationally by certain Distributors on sports tiers or in similar packages. We continually seek to enhance the value that our networks provide to viewers, advertisers and Distributors by delivering high-quality, best-in-class content and live viewing experiences utilizing state-of-the-art technology. We operate in the nation’s largest television market, the New York Designated Market Area (“DMA”), and attract an important and coveted demographic. Our unique position in this major media market, as the provider of exclusive live local games of top professional sports teams and other significant sports programming, allows us to optimize distribution revenue and partner with marquee brands to capture advertising sales and explore new content opportunities. We extend the distribution of our content through MSG GO, our live authenticated streaming and video on demand offering, and continue to evaluate new distribution avenues for our programming. In addition, we utilize a dedicated website, and social media platforms to promote our brands by teasing content, spotlighting on-air talent, and providing in-depth information about the teams featured on our networks. Beginning with the debut of MSGN as the first regional sports network in the country in 1969, we have been at the forefront of the industry, consistently pushing the boundaries of regional sports coverage. In the process, our networks have become a powerful platform for some of the world’s greatest athletes and entertainers. With our commitment to programming excellence, we have earned a reputation for best-in-class programming, production, marketing and technical innovation. Over the past ten years, we have won 152 New York Emmy Awards (“Emmys”) for live sports and original programming. This includes 129 Emmys for MSGN alone — more than any other single station or network in the region over that time frame. New York Rangers (the “Rangers”), New York Islanders (the “Islanders”), New Jersey Devils (the “Devils”) and Buffalo Sabres (the “Sabres”) of the National Hockey League (“NHL”); the New York Liberty (the “Liberty”) of the Women’s National Basketball Association (“WNBA”); the New York Red Bulls (the “Red Bulls”) of Major League Soccer, and the Westchester Knicks of the National Basketball Association G League. Additionally, we air programming relating to the New York Giants (the “Giants”) and Buffalo Bills (the “Bills”) of the National Football League (“NFL”). Our arrangements include long-term media rights agreements with all of our NBA and NHL teams. Each year, MSGN and MSG+ collectively telecast approximately 500 live professional games, along with a comprehensive lineup of other sporting events, including college football and basketball, and original programming designed to give fans behind-the-scenes access and insight into the teams and players they love. This content includes comprehensive pre- and post-game coverage throughout the seasons, along with team-related programming that features coaches, players and more, all of which enable us to capitalize on the extraordinary enthusiasm of our teams’ fans. Distinguishing these shows further is our roster of renowned analysts and on-air talent, which includes Mike Breen, Walt Frazier, Sam Rosen, Joe Micheletti, Al Trautwig, and Kenny Albert, among others. As the regional sports home of both the Giants and the Bills, our networks feature extensive content specifically for fans of both teams, which during the 2017-18 NFL season included pre- and post-game coverage and other team-related programming. In addition to our live games and team-related programming, we produce an evolving slate of compelling original programming to appeal to our existing viewers and attract new audiences. Notable highlights this past year include: “KNX Gaming,” a first-of-its-kind, behind-the-scenes show featuring the Knicks Gaming team in the NBA 2K League; “Beginnings,” which chronicles how athletes and entertainers got their start; and “People Talking Sports* (*And Other Stuff),” conversations on the latests topics in sports and entertainment, featuring a variety of sports and celebrity guests. We also debuted “MSG Shorts,” short-form content focused on unique and interesting stories in sports, that is suited for our linear networks, as well as digital and social platforms, and targeted to a younger audience. This programming has included popular content from Complex, an urban lifestyle media platform, including “Sneaker Shopping,” “Hot Ones” and “Sean in the Wild;” “Sports Stories of New York,” short documentaries on rarely-told stories in New York sports; and short-form interviews with high-profile athletes and celebrities. MSG Networks also showcase a wide array of other sports and entertainment programming, which this past year included live National Collegiate Athletic Association basketball and football, Union of European Football Association soccer, Bundesliga soccer, and Ultimate Fighting Championship and other mixed martial arts, as well as tennis and boxing programs. In addition to MSGN and MSG+, the Company distributes programming through MSG GO. MSG GO allows subscribers to access live television and on demand content, including all Knicks, Rangers, Islanders, Devils, Sabres, Liberty, Red Bulls and Westchester Knicks games appearing on our networks in a subscriber’s geographic region, using their smartphones, tablets and computers. MSG GO is currently available to subscribers of all our major Distributors. The Company generates revenues principally from affiliate fees charged to Distributors for the right to carry our programming networks, as well as from the sale of advertising. The following customers each accounted for more than 10% of consolidated revenues for the year ended June 30, 2018: Altice USA, AT&T, Charter, and Verizon. Our networks are distributed pursuant to carriage agreements that are typically structured as multi-year agreements with staggered expiration dates and generally provide for annual contractual rate increases. We primarily earn revenue under these agreements based on the number of each Distributor’s subscribers or subscribers that receive our networks. Our affiliation agreements include certain protections relating to the manner in which our networks are carried, and the compensation for such carriage. Examples of such protections include: carriage requirements; penetration minimums (which may require that our networks are made available to significant percentages of our Distributors’ basic subscribers); tag-along requirements (which require that MSGN and MSG+ are carried on the same tier as other networks); and/or payment minimums (which require us to be compensated based on significant percentages of our Distributors’ subscribers). Affiliation fee revenue constituted at least 90% of our consolidated revenues for the year ended June 30, 2018. MSGN and MSG+ are widely carried by major Distributors in our region, with an average combined reach of approximately 7.0 million viewing subscribers (as of the most recent available information) in our Regional Territory. Our networks also enjoy national distribution with certain Distributors on sports tiers or in similar packages. The Company’s programming, Regional Territory and viewer demographics make our networks attractive to advertisers. Our networks operate in the largest television market in the country, the New York DMA, and, with our exclusive live game coverage, offer advertisers an increasingly scarce asset in today’s evolving media landscape - the ability to reach engaged audiences on a live basis. MSG Networks’ viewers, a significant portion of whom are between the ages of 25-54 with high household incomes, also offer an appealing demographic for advertisers. In addition, we benefit from our advertising sales representation agreement with MSG, which provides for the packaged sale of certain network advertising inventory as part of team and arena marketing and sponsorship sales. Advertising revenue is based on the price received for available advertising inventory. Substantially all of our advertising revenue is derived from the sale of inventory in our live professional sports programming. The value of this inventory is dependent upon a number of factors, including team performance, ratings and general economic conditions. Advertising time is sold both in advance and in scatter markets. Our Company has a close association with the Garden of Dreams Foundation (the “Foundation”), a non-profit charity that has brightened the lives of nearly 375,000 children and their families. The Foundation, which started in 2006, works with 30 partner organizations throughout the tristate area, including hospitals, wish organizations and community-based organizations, to reach children who are facing challenges such as homelessness, extreme poverty, illness and foster care. The Foundation takes pride in its commitment to truly change lives, hosting more than 500 events and programs each year. The Company and the Foundation present “MSG Classroom,” an Emmy Award-winning educational program to teach high school students about the media industry. The eight-week program provides a hands-on opportunity for students to develop skills, including broadcasting, script writing and production, and culminates with the students creating their own programming feature. The MSG Classroom program has been recognized with multiple Beacon Awards in the “Education” category, as well as an Emmy Award in the “Community Service” category. The Federal Communications Commission (“FCC”) imposes regulations directly on programming networks and also imposes regulations on certain distributors that affect programming networks indirectly. The rules, regulations, policies and procedures affecting our business are subject to change. The following paragraphs describe the existing legal and regulatory requirements that are most significant to our business today; they do not purport to describe all present and proposed laws and regulations affecting our business. Our programming networks must provide closed captioning of video programming for the hearing impaired and meet certain captioning quality standards. The FCC and certain of our affiliation agreements require us to certify compliance with such standards. We are also required to provide closed captioning on certain video content delivered via the Internet. FCC rules require multichannel video programming distributors (“MVPD”) to ensure that all commercials comply with specified volume standards, and certain of our affiliation agreements require us to certify compliance with such standards. Any programming and associated Internet websites intended primarily for children under 12 years of age that we may offer must comply with certain limits on commercial content. Distributors are prohibited from transmitting obscene programming, and certain of our affiliation agreements require us to refrain from including such programming on our networks. The FCC periodically considers examining whether to adopt rules regulating how programmers package and price their networks, such as whether programming networks require distributors to purchase and carry undesired programming in return for the right to carry desired programming and, if so, whether such arrangements should be prohibited. The FCC’s implementation of the statutory “must-carry” obligations requires cable and satellite distributors to give broadcasters preferential access to channel space. This may reduce the amount of channel space that is available for carriage of our networks. We maintain various websites and mobile applications that may be subject to third-party application store requirements, as well as a range of federal, state and local laws such as privacy, accessibility for persons with disabilities, and consumer protection regulations. The business of distributing programming networks is highly competitive. Our programming networks face competition from other programming networks, including other regional sports networks, for the right to be carried by a particular distributor, and for the right to be carried on the service tier that will attract the most subscribers. Once a programming network of ours is carried by a distributor, that network competes for viewers not only with the other programming networks available through the distributor, but also with pay-per-view programming and video on demand offerings, as well as Internet and online streaming services, mobile applications, radio, print media, motion picture theaters, home video, and other sources of information, sporting events and entertainment. Each of the following competitive factors are important to our networks: the prices we charge for our programming networks, the quantity, quality (in particular, the performance of the sports teams whose media rights we control) and the variety of the programming offered on our networks; and the effectiveness of our networks’ marketing efforts. Our ability to successfully compete with other programming networks for distribution may be hampered because the distributors may be affiliated with other programming networks. In addition, because such affiliated distributors may have a substantial number of subscribers, the ability of such competing programming networks to obtain distribution on affiliated distributors may lead to increased subscriber and advertising revenue for such networks because of their increased penetration compared to our programming networks. Even if such affiliated distributors carry our programming networks, there is no assurance that such distributors will not place their affiliated programming network on a more desirable tier, thereby giving the affiliated programming network a competitive advantage over our own. New or existing programming networks that are owned by or affiliated with broadcast networks such as NBC, ABC, CBS or Fox may also have a competitive advantage over our networks in obtaining distribution through the “bundling” of agreements to carry those programming networks with the agreement giving the distributor the right to carry a broadcast station owned by or affiliated with the network. In addition, content providers (such as certain broadcast and cable networks) and new content developers, distributors and syndicators (such as Amazon and Netflix), are distributing programming directly to consumers on an “over-the-top” (“OTT”) basis. Such direct-to-consumer OTT distribution of content may facilitate consumers eliminating or downgrading their pay television subscription, which may result in certain consumers not receiving our programming networks. See “Item 1A. Risk Factors — Our Business Faces Intense and Wide-Ranging Competition Which May Have a Material Negative Effect on Our Business and Results of Operations” and “— We May Not Be Able to Adapt to New Content Distribution Platforms and to Changes in Consumer Behavior Resulting From Emerging Technologies, Which May Have a Material Negative Effect on Our Business and Results of Operations.” See also “Part II — Item 7. Management’s Discussion and Analysis of Financial Condition and Results of Operations — Business Overview — Revenue Sources” for a discussion of our customers. We also compete with other networks and other distribution outlets to secure desired programming, including sports-related programming. Competition for programming increases as the number of programming networks and distribution outlets, including, but not limited to, streaming outlets, increases. Other programming networks, or distribution outlets, that are affiliated with or otherwise have larger relationships with programming sources such as sports teams or leagues, movie or television studios, or film libraries may have a competitive advantage over us in this area. Because the loyalty of the sports viewing audience to a sports programming network is primarily driven by loyalty to a particular team or teams, access to adequate sources of sports programming is particularly critical to our networks. In connection with the Distribution, the Company entered into long-term media rights agreements with MSG providing us with the exclusive media rights to Knicks and Rangers games, and the Company has long-term media rights agreements with the Islanders, Devils and Sabres. Our rights with respect to these professional teams may be limited in certain circumstances due to rules imposed by the leagues in which they compete. Our programming networks compete for telecast rights for other teams or events principally with national or regional programming networks that specialize in or carry sports programming; local and national commercial broadcast television networks; independent syndicators that acquire and resell such rights nationally, regionally and locally; and Internet and mobile-based distributors of programming. Some of our competitors may own or control, or are owned or controlled by, sports teams, leagues or sports promoters, which gives them an advantage in obtaining telecast rights for such teams or sports. For example, two professional sports teams located in New York have ownership interests in programming networks featuring the games of their teams. Distributors may also contract directly with the sports teams in their local service areas for the right to distribute games on their platforms. The increasing amount of sports programming available on a national basis, including pursuant to national media rights arrangements (e.g., NBA on ABC, ESPN, and TNT and NHL on NBC and NBC Sports Network), as part of league-controlled sports programming networks (e.g., NBA TV and NHL Network), in out-of-market packages (e.g., NBA League Pass and NHL Center Ice), league and other websites, mobile applications and streaming outlets, may have an adverse impact on our competitive position as our programming networks compete for distribution and for viewers. As of June 30, 2018 we had approximately 180 full-time union and non-union employees and 610 part-time union and non-union employees. As of June 30, 2018, approximately 75% of the Company’s workforce is subject to collective bargaining agreements (“CBAs”). As of June 30, 2018, approximately 4% of the Company’s workforce that is subject to a CBA is covered by a CBA that is expired. In addition, as of June 30, 2018, approximately 87% of the Company’s workforce that is subject to a CBA is covered by a CBA that expires within the next fiscal year. Labor relations in general and in the sports and entertainment industry in particular can be volatile, though we believe that our current relationships with our unions taken as a whole are positive. Following the Distribution, the Company operates and reports financial information in one segment. Substantially all revenues and assets of the Company are attributed to or located in the United States, and are primarily concentrated in the New York City metropolitan area. Financial information for each of the years ended June 30, 2018, 2017, and 2016 is set forth in “Part II — Item 7. Management’s Discussion and Analysis of Financial Condition and Results of Operations,” and “Part II — Item 8. Financial Statements and Supplementary Data,” of this Annual Report on Form 10-K. The Success of Our Business Depends on Affiliation Fees We Receive Under Our Affiliation Agreements, the Loss of Which or Renewal of Which on Less Favorable Terms May Have a Material Negative Effect on Our Business and Results of Operations. Our success is dependent upon the existence and terms of our agreements with Distributors. Existing affiliation agreements of our programming networks expire at various dates. We cannot provide assurances that we will be able to renew these affiliation agreements or obtain terms as attractive as our existing agreements in the event of a renewal. Our affiliation agreements generally require us to meet certain content criteria, such as minimum thresholds for professional event telecasts throughout the year on our networks. If we were unable to meet these criteria, we could become subject to remedies available to the Distributors, which may include fee reductions, rebates or refunds and/or termination of these agreements in some cases. In addition, under certain circumstances, an existing affiliation agreement may expire and the parties may have not finalized negotiations of either a renewal of that agreement or a new agreement for certain periods of time. In certain of these circumstances, Distributors may continue to carry the service(s) until the execution of definitive renewal or replacement agreements (or until we or the Distributor determine that carriage should cease). Occasionally we may have disputes with Distributors over the terms of our affiliation agreements. If not resolved through business discussions, such disputes could result in litigation or actual or threatened termination of an existing agreement. Our Business Faces Intense and Wide-Ranging Competition Which May Have a Material Negative Effect on Our Business and Results of Operations. Our business competes, in certain respects and to varying degrees, for viewers and advertisers with other programming networks, pay-per-view, video on demand, online streaming services, and other content offered by distributors. We also compete for viewers and advertisers with content offered over the Internet, mobile media, radio, motion picture, home video and other sources of information and entertainment and advertising services. Important competitive factors are the prices we charge for our programming networks, the quantity, quality (in particular, the performance of the sports teams whose media rights we control), the variety of the programming offered and the effectiveness of marketing efforts. New or existing programming networks that are owned by or affiliated with broadcast networks such as NBC, ABC, CBS or Fox may have a competitive advantage over our networks in obtaining distribution through the “bundling” of agreements to carry those programming networks with the agreement giving the distributor the right to carry a broadcast station owned by or affiliated with the network. For example, regional sports networks affiliated with Fox and NBC are carried on certain OTT platforms that do not currently carry our networks. The competitive environment in which our business operates may also be affected by technological developments. It is difficult to predict the future effect of technology on many of the factors affecting our competitive position. With respect to advertising services, factors affecting the degree and extent of competition include prices, reach and audience demographics among others. Some of our competitors are large companies that have greater financial resources available to them than we do which could impact our viewership, and the resulting advertising revenues. We May Not Be Able to Adapt to New Content Distribution Platforms and to Changes in Consumer Behavior Resulting From Emerging Technologies, Which May Have a Material Negative Effect on Our Business and Results of Operations. the revenues we are able to generate from our traditional distribution methods, by decreasing the viewership of our programming networks on cable and other MVPD systems which are almost entirely directed at television video delivery and/or by making advertising on our programming networks less valuable to advertisers. If we fail to adapt our distribution methods and content to emerging technologies, our appeal to our targeted audiences might decline and there could be a material negative effect on our business and results of operations. MSG GO, which is our live streaming and on-demand product, is available to subscribers through all of our major Distributors. There can be no assurance that MSG GO will be able to attract a meaningful number of users. In addition, advertising revenues could be significantly impacted by emerging technologies, given that advertising sales are dependent on audience measurement provided by third parties, and the results of audience measurement techniques can vary independent of the size of the audience for a variety of reasons, including difficulties related to the traditional statistical sampling methods, ability to measure new distribution platforms and viewing technologies, and the shifting of the marketplace to the use of measurement of different viewer behaviors, such as delayed viewing. In addition, multiplatform campaign verification is in its infancy, and viewership on tablets, smart phones and other mobile devices, which continues to grow, is presently not measured by any one consistently applied method. Moreover, devices that allow users to fast forward or skip programming, including commercials, are causing changes in consumer behavior that may affect the desirability of our programming networks to advertisers. These variations and changes could have a significant effect on advertising revenues. If the Rate of Decline in the Number of Subscribers to Traditional MVPD Services Increases or These Subscribers Shift to Other Services or Bundles That Do Not Include the Company’s Programming Networks, There May Be a Material Negative Effect on the Company’s Affiliation Revenues. During the last few years, the number of subscribers to traditional MVPD services in the U.S. has been declining. In addition, Distributors have introduced, marketed and/or modified tiers or bundles of programming that have impacted the number of subscribers that receive our programming networks, including tiers or bundles of programming that exclude our programming networks. As a result of these factors, the Company has experienced a decrease in viewing subscribers during each of our last three fiscal years, which has adversely affected our operating results. If traditional MVPD service offerings are not attractive to consumers due to pricing, increased competition from OTT services, increased dissatisfaction with the quality of traditional MVPD services, poor economic conditions or other factors, more consumers may (i) cancel their traditional MVPD service subscriptions or choose not to subscribe to traditional MVPD services, (ii) elect to instead subscribe to OTT services, which in some cases may be offered at a lower price-point or (iii) elect to subscribe to smaller bundles of programming which may not include our programming networks. If the rate of decline in the number of traditional MVPD service subscribers increases or if subscribers shift to OTT services or smaller bundles of programming that do not include the Company’s programming networks, this may have a material negative effect on the Company’s revenues. We Depend on a Limited Number of Distributors for a Significant Portion of Our Revenues and Further Industry Consolidation Could Adversely Affect Our Business and Results of Operations. The pay television industry is highly concentrated, with a relatively small number of distributors serving a significant percentage of pay television subscribers that receive our programming networks, thereby affording the largest distributors significant leverage in their relationship with programming networks, including us. Substantially all of our affiliation fee revenue comes from our top five Distributors. Further consolidation in the industry could reduce the number of distributors available to distribute our programming networks and increase the negotiating leverage of certain distributors, which could adversely affect our revenue. In some cases, if a Distributor is acquired, the affiliation agreement of the acquiring Distributor will govern following the acquisition. In those circumstances, the acquisition of a Distributor that is a party to one or more affiliation agreements with us on terms that are more favorable to us than that of the acquirer could have a material negative impact on our business and results of operations. See Note 17 to the consolidated financial statements included in Item 8 of this Annual Report on Form 10-K.
We Derive Substantial Revenues From the Sale of Advertising Time and Those Revenues Are Subject to a Number of Factors, Many of Which Are Beyond Our Control. caused by increased availability of alternative forms of leisure and entertainment activities; (ix) consumer budgeting and buying patterns; (x) the extent of the distribution of our networks; and (xi) team performance. A decline in the economic prospects of advertisers or the economy in general could alter current or prospective advertisers’ spending priorities, which could cause our revenues and operating results to decline significantly in any given period. Even in the absence of a general recession or downturn in the economy, an individual business sector that tends to spend more on advertising than other sectors might be forced to reduce its advertising expenditures if that sector experiences a downturn. In such case, a reduction in advertising expenditures by such a sector may adversely affect our revenues. The pricing and volume of advertising may be affected by shifts in spending away from more traditional media toward online and mobile offerings or towards new ways of purchasing advertising, such as through automated purchasing, dynamic advertising insertion, third parties selling local advertising spots and advertising exchanges, some or all of which may not be as advantageous to the Company as current advertising methods. Our Media Rights Agreements With Various Professional Sports Teams Have Varying Durations and Terms and We May Be Unable to Renew Those Agreements on Acceptable Terms or Such Rights May Be Lost for Other Reasons. Our business is dependent upon media rights agreements with professional sports teams. Upon expiration, we may seek renewal of these agreements and, if we do, we may be outbid by competing programming networks or others for these agreements or the renewal costs could substantially exceed our costs under the current agreements. Even if we are able to renew such agreements, the Company’s results could be adversely affected if escalations in sports programming rights costs are unmatched by increases in affiliation and advertising revenues. In addition, one or more of these teams may seek to establish their own programming network or join one of our competitor’s networks and, in certain circumstances, we may not have an opportunity to bid for the media rights. Moreover, the value of these agreements may also be affected by various league decisions and/or league agreements that we may not be able to control, including a decision to alter the number of games played during a season. The value of these media rights can also be affected, or we could lose such rights entirely, if a team is liquidated, undergoes reorganization in bankruptcy or relocates to an area where it is not possible or commercially feasible for us to continue to distribute games. Any loss or diminution in the value of rights could impact the extent of the sports coverage offered by us and could materially negatively affect our business and results of operations. In addition, our affiliation agreements typically include certain remedies in the event our networks fail to meet a minimum number of professional event telecasts, and, accordingly, any loss of rights could materially negatively affect our business and results of operations. The Actions of the Basketball and Hockey Leagues May Have a Material Negative Effect on Our Business and Results of Operations. The governing bodies of the NBA and the NHL have imposed, and may impose in the future, various rules, regulations, guidelines, bulletins, directives, policies and agreements (collectively, “League Rules”), which could have a material negative effect on our business and results of operations. For example, each league imposes rules that define the territories in which we may distribute games of the teams in the applicable league. Changes to these rules or other League Rules, or the adoption of new League Rules, could have a material negative effect on our business and results of operations. Our Business is Substantially Dependent on the Popularity of the NBA and NHL Teams Whose Media Rights We Control. Our business has historically been, and we expect will continue to be, dependent on the popularity of the NBA and NHL teams whose local media rights we control and, in varying degrees, those teams achieving on-court and on-ice success, which can generate fan enthusiasm, resulting in increased viewership and advertising revenues. Furthermore, success in the regular season may qualify a team for participation in the post-season, which generates increased excitement and interest in the teams, which can improve viewership and advertising revenues. In addition, if a team declines in popularity or fails to generate fan enthusiasm, this may negatively impact the terms on which our affiliate agreements are renewed. There can be no assurance that any sports team will generate fan enthusiasm or compete in post-season play and the failure to do so could result in a material negative effect on our business and results of operations. We May Be Unable to Obtain Programming From Third Parties on Reasonable Terms, Which Could Lead to Higher Costs. We rely on third parties for sports and other programming for our networks. We compete with other providers of programming to acquire the rights to distribute such programming. If we fail to continue to obtain sports and other programming for our networks on reasonable terms for any reason, including as a result of competition, we could be forced to incur additional costs to acquire such programming or look for alternative programming, which may have a material negative effect on our business and results of operations. Our Business Depends on the Appeal of Our Programming, Which May Be Unpredictable, and Increased Programming Costs May Have a Material Negative Effect on Our Business and Results of Operations. Our business depends in part upon viewer preferences and audience acceptance of the programming on our networks. These factors are often unpredictable and subject to influences that are beyond our control, such as the quality and appeal of competing programming, general economic conditions and the availability of other entertainment options. We may not be able to successfully predict interest in proposed new programming and viewer preferences could cause new programming not to be successful or cause our existing programming to decline in popularity. An increase in our costs associated with programming, including original programming, may materially negatively affect our business and results of operations. Our Business Has Been Adversely Impacted and May, in the Future, Be Materially Adversely Impacted by an Economic Downturn and Financial Instability. Our business depends upon the ability and willingness of consumers and businesses to subscribe to a package of programming that includes our networks. In addition, our business is dependent upon advertising revenues. As a result, instability and weakness of the U.S. and global economies and the negative effects on consumers’ and businesses’ discretionary spending may materially negatively affect our business and results of operations. Weather or Other Conditions Which Are Outside Our Control May Disrupt Our Programming and May Have a Material Negative Effect on Our Business and Results of Operations. Weather or other conditions, including natural disasters, acts of terrorism and similar events, which are outside our control may prevent us or our Distributors from providing our programming to customers, may reduce advertising expenditures and may have a material negative effect on our business and results of operations. We Are Subject to Governmental Regulation and Our Failure to Comply With These Regulations May Have a Material Negative Effect on Our Business and Results of Operations. Our business is subject to federal, state and local laws and regulations. Some FCC regulations apply to us directly and other FCC regulations, although imposed on distributors, affect programming networks indirectly. See “Item 1. Business — Regulation.” Legislative enactments, court actions, and federal regulatory proceedings could materially affect our programming business by modifying the rates, terms, and conditions under which we offer our programming networks to distributors and the public, or otherwise materially affect the range of our activities or strategic business alternatives. We cannot predict the likelihood or results of any such legislative, judicial, or regulatory actions. Furthermore, to the extent that regulations and laws, either presently in force or proposed, hinder or stimulate the growth of distributors, our business could be affected. The U.S. Congress and the FCC currently have under consideration, and may in the future adopt, amend, or repeal, laws, regulations and policies regarding a wide variety of matters that could, directly or indirectly, affect our business. The regulation of distributors is subject to the political process and has been in constant flux over the past two decades. Further material changes in the law and regulatory requirements must be anticipated. Our business and our results of operations may be materially negatively affected by future legislation, new regulation or deregulation. Our business is, and may in the future be, subject to a variety of other laws and regulations, including licensing requirements; working conditions, labor, immigration and employment laws; and privacy laws. Our failure to comply with applicable governmental laws and regulations, or to maintain necessary permits or licenses, could have a material negative effect on our business and results of operations. We Face Continually Evolving Cybersecurity and Similar Risks, Which Could Result in the Disclosure of Confidential Information, Disruption of Our Business, Damage to Our Brands and Reputation, Legal Exposure and Financial Losses. safeguard such personal information and other confidential information, including information regarding the Company and our Distributors, advertisers and employees, is important to our business. We take these matters seriously and take significant steps to protect our stored information. These protections are costly and require ongoing monitoring and updating as technologies change and efforts to overcome security measures become more sophisticated. Despite our efforts, the risks of a data breach cannot be entirely eliminated and our information technology and other systems that maintain and transmit consumer, Distributor, advertiser, Company, employee and other confidential information may be compromised. This could compromise the security of information on our network, or that of a third-party service provider, including MSG to which we outsource information technology support, due to employee error, computer malware or ransomware, viruses, hacking and phishing attacks, or otherwise. Additionally, outside parties may attempt to fraudulently induce employees or users to disclose sensitive or confidential information in order to gain access to data. As a result, such personal and/or confidential information may be lost, disclosed, accessed or taken without their consent, and the security of our other confidential information may be compromised. See —“We Rely on MSG’s Performance Under Various Agreements” for a discussion of services MSG performs on our behalf. If our electronically stored data is compromised, our ability to conduct business may be interrupted or impaired, we may lose profitable opportunities or the value of those opportunities may be diminished and we may lose revenue as a result of unlicensed use of our intellectual property. Further, a penetration of our network security or other misappropriation or misuse of personal or confidential information could subject us to business and litigation risk, including costs associated with such misappropriation or misuse, and damage our reputation, which could have a material negative effect on our business and results of operations. We Have Substantial Indebtedness and Are Highly Leveraged, Which Could Adversely Affect Our Business. Immediately prior to the Distribution we incurred a significant amount of debt, substantially all of the proceeds of which were contributed to MSG. We may also continue to incur additional debt in the future. We are highly leveraged and expect to continue to be highly leveraged. As a result, our interest and principal payments on our borrowings are significant in relation to our revenues and cash flows. These payments reduce our earnings and cash available for other potential business purposes. This leverage also exposes us to significant risk by limiting our flexibility in planning for, or reacting to, changes in our business (whether through competitive pressure or otherwise), the cable and telecommunications industries, and the economy at large. Although our cash flows could decrease in these scenarios, our required payments in respect of indebtedness would not decrease. In addition, our ability to make payments on, or repay or refinance, such debt, and to fund our operating and capital expenditures, depends largely upon our future operating performance. Our future operating performance, to a certain extent, is subject to general economic, financial, competitive, regulatory and other factors that are beyond our control. Furthermore, our interest expense could increase if interest rates increase because our indebtedness bears interest at floating rates or to the extent we have to refinance existing debt with higher cost debt. We May Require Additional Financing to Fund Our Ongoing Operations and Capital Expenditures, the Availability of Which is Highly Uncertain. The capital and credit markets can experience volatility and disruption. Such markets can exert extreme downward pressure on stock prices and upward pressure on the cost of new debt capital and can severely restrict credit availability for most issuers. Although we have a revolving credit facility (see “Part II - Item 7. Management’s Discussion and Analysis of Financial Condition and Results of Operations — Liquidity and Capital Resources — Financing Agreements”), our ability to draw on such facility will depend on our ability to meet certain financial tests and other conditions. In addition, there can be no assurance that we will be able to refinance any such facility in the future or raise any required additional capital or do so on favorable terms. Depending upon conditions in the financial markets and/or the Company’s financial performance, we may not be able to raise capital on favorable terms, or at all. Organized Labor Matters May Have a Material Negative Effect on Our Business and Results of Operations. Our business is substantially dependent upon the efforts of unionized workers. As of June 30, 2018, approximately 75% of our employees are subject to CBAs. Any labor disputes, such as strikes or lockouts, with the unions with which we have collective bargaining agreements, could have a material negative effect on our business and results of operations by impacting our ability to produce or present programming. shortened regular season in each case. The NHL has also experienced labor difficulties, including lockouts during the 1994-95 and 2012-13 seasons, resulting in a shortened regular season in each case, and a lockout beginning in September 2004, which resulted in the cancellation of the entire 2004-05 NHL season. The Unavailability of Satellites, Facilities, Systems and/or Software Upon Which We Rely May Have a Material Negative Effect on Our Business and Results of Operations. We use satellite and other systems to transmit our programming services to Distributors. The distribution facilities include uplinks, communications satellites, and downlinks. Notwithstanding certain back-up and redundant systems, transmissions may be disrupted, including as a result of events that impair uplinks, downlinks or transmission facilities or the impairment of satellite or terrestrial facilities. Currently, there are a limited number of communications satellites available for the transmission of programming, and their continued availability may depend upon a variety of factors including business conditions, technology issues, and changes in law or regulation. If a disruption occurs, we may not be able to secure alternate distribution facilities in a timely manner. In addition, we rely upon various internal and third-party systems or software in the operation of our business, including, with respect to database, human resource management, and financial systems. From time to time, certain of these arrangements may not be covered by long-term agreements. In addition, such distribution facilities and/or internal or third party services, systems or software could be adversely impacted by cybersecurity threats including unauthorized breaches. The failure or unavailability of distribution facilities or these internal and third-party services, systems or software, depending upon its severity and duration, could have a material negative effect on our business and results of operations. We May Become Subject to Infringement or Other Claims Relating to Our Content or Technology. From time to time, third parties may assert against us alleged intellectual property (e.g., copyright, trademark and patent) or other claims relating to our programming, technologies, digital content or other content, some of which may be important to our business. In addition, our programming could potentially subject us to claims of defamation or similar types of allegations. Any such claims, regardless of their merit, could cause us to incur significant costs. In addition, if we are unable to continue use of certain intellectual property rights, our business and results of operations could be materially negatively impacted. Theft of Our Intellectual Property May Have a Material Negative Effect on Our Business and Results of Operations. The success of our business depends in part on our ability to maintain and monetize our intellectual property rights to our programming, technologies, digital content and other content that is material to our business. Theft of our intellectual property, including content, could have a material negative effect on our business and results of operations because it may reduce the revenue that we are able to receive from the legitimate sale and distribution of our content, undermine lawful distribution channels, limit our ability to control the marketing of our content and inhibit our ability to recoup or profit from the costs incurred to create such content. Litigation may be necessary to enforce our intellectual property rights or protect our trade secrets. Any litigation of this nature, regardless of the outcome, could cause us to incur significant costs. We May Pursue Acquisitions and Other Strategic Investments to Complement or Expand Our Business That May Not Be Successful. We may explore opportunities to purchase or invest in other businesses or assets that could complement, enhance or expand our current business or that might otherwise offer us growth opportunities, including opportunities that may differ from the Company’s current business. Any transactions that we are able to identify and complete may involve risks, including the commitment of significant capital, the incurrence of indebtedness, the payment of advances, the diversion of management’s attention and resources from our existing business to develop and integrate the acquired or combined business, the inability to successfully integrate such business or assets into our operations, litigation or other claims in connection with acquisitions or against companies we invest in or acquire, our lack of control over joint venture companies and other minority investments, the risk of not achieving the intended results and the exposure to losses if the underlying transactions or ventures are not successful. Any such risks could result in a material negative effect on our business and results of operations. We Are Controlled by the Dolan Family. As a Result of Their Control, the Dolan Family Has the Ability to Prevent or Cause a Change in Control or Approve, Prevent or Influence Certain Actions by the Company. Class A Common Stock, which is entitled to one vote per share and is entitled collectively to elect 25% of our Board of Directors. Class B Common Stock, which is entitled to ten votes per share and is entitled collectively to elect the remaining 75% of our Board of Directors. As of July 31, 2018, the Dolan family, including trusts for the benefit of members of the Dolan family (collectively, the “Dolan Family Group”), collectively own all of our outstanding Class B Common Stock and approximately 3.2% (inclusive of options exercisable within 60 days of the date hereof) of our outstanding Class A Common Stock, and as a result hold approximately 70.0% of the total voting power of all our outstanding common stock. The members of the Dolan Family Group holding Class B Common Stock have executed a stockholders agreement (the “Stockholders Agreement”) that has the effect of causing the voting power of the holders of our Class B Common Stock to be cast as a block with respect to all matters to be voted on by holders of Class B Common Stock. Under the Stockholders Agreement, the shares of Class B Common Stock owned by members of the Dolan Family Group are to be voted on all matters in accordance with the determination of the Dolan Family Committee, except that the decisions of the Dolan Family Committee are non-binding with respect to the Class B Common Stock owned by certain Dolan family trusts that collectively own 40.5% of the outstanding Class B Common Stock (“Excluded Trusts”). The “Dolan Family Committee” consists of Charles F. Dolan and his six children, James L. Dolan, Thomas C. Dolan, Patrick F. Dolan, Kathleen M. Dolan, Deborah A. Dolan-Sweeney, and Marianne Dolan Weber. The Dolan Family Committee generally acts by a majority vote, except that approval of a going-private transaction must be approved by a two-thirds vote and approval of a change-in-control transaction must be approved by not less than all but one vote. The voting members of the Dolan Family Committee are James L. Dolan, Thomas C. Dolan, Kathleen M. Dolan, Deborah A. Dolan-Sweeney, and Marianne Dolan Weber, with each member having one vote other than James L. Dolan, who has two votes. Because James L. Dolan has two votes, he has the ability to block Dolan Family Committee approval of any Company change in control transaction. Shares of Class B Common Stock owned by Excluded Trusts are to be voted on all matters in accordance with the determination of the Excluded Trusts holding a majority of the Class B Common Stock held by all Excluded Trusts, except in the case of a vote on a going-private transaction or a change in control transaction, in which case a vote of trusts holding two-thirds of the Class B Common Stock owned by Excluded Trusts is required. The Dolan Family Group is able to prevent a change in control of our Company and no person interested in acquiring us will be able to do so without obtaining the consent of the Dolan Family Group. The Dolan Family Group, by virtue of their stock ownership, have the power to elect all of our directors subject to election by holders of Class B Common Stock and are able collectively to control stockholder decisions on matters on which holders of all classes of our common stock vote together as a single class. These matters could include the amendment of some provisions of our certificate of incorporation and the approval of fundamental corporate transactions. any amendment, alteration or repeal of any of the provisions of our certificate of incorporation that adversely affects the powers, preferences or rights of the Class B Common Stock. As a result, the Dolan Family Group also has the power to prevent such issuance or amendment. The Dolan Family Group also controls MSG and AMC Networks Inc. (“AMC Networks”). We Have Elected to Be a “Controlled Company” for New York Stock Exchange Purposes Which Allows Us Not to Comply With Certain of the Corporate Governance Rules of New York Stock Exchange. Members of the Dolan Family Group have entered into the Stockholders Agreement relating, among other things, to the voting of their shares of our Class B Common Stock. As a result, we are a “controlled company” under the corporate governance rules of New York Stock Exchange (“NYSE”). Our Board of Directors has elected for the Company to be treated as a “controlled company” under NYSE corporate governance rules and not to comply with the NYSE requirement for a majority independent board of directors and for an independent corporate governance and nominating committee because of our status as a controlled company. Nevertheless, our Board of Directors has elected to comply with the NYSE requirement for an independent compensation committee. Future Stock Sales, Including as a Result of the Exercise of Registration Rights by Certain of Our Stockholders, Could Adversely Affect the Trading Price of Our Class A Common Stock. Certain parties have registration rights covering a portion of our shares. We have entered into registration rights agreements with Charles F. Dolan, members of his family, certain Dolan family interests and the Dolan Family Foundation that provide them with “demand” and “piggyback” registration rights with respect to approximately 15 million shares of Class A Common Stock, including shares issuable upon conversion of shares of Class B Common Stock. Sales of a substantial number of shares of Class A Common Stock could adversely affect the market price of the Class A Common Stock and could impair our future ability to raise capital through an offering of our equity securities. We Share Certain Key Executives and Directors With MSG and/or AMC Networks, Which Means Those Executives Do Not Devote Their Full Time and Attention to Our Affairs and the Overlap May Give Rise to Conflicts. Our Executive Chairman, James L. Dolan, also serves as Executive Chairman and Chief Executive Officer of MSG, and our Executive Vice President, General Counsel and Secretary, Lawrence J. Burian, also serves as the Executive Vice President, General Counsel and Secretary of MSG. As a result, not all of our executive officers devote their full time and attention to the Company’s affairs. In addition, our Vice Chairman, Gregg G. Seibert, also serves as the Vice Chairman of both MSG and AMC Networks, and one of our directors, Charles F. Dolan, is the Executive Chairman of AMC Networks. Furthermore, six (including James L. Dolan) members of our Board of Directors are also directors of MSG and six (including James L. Dolan) members of our Board of Directors are also directors of AMC Networks concurrently with their service on our Board of Directors. The overlapping officers and directors may have actual or apparent conflicts of interest with respect to matters involving or affecting each company. For example, the potential for a conflict of interest exists when we on the one hand, and MSG or AMC Networks on the other hand, look at certain acquisitions and other corporate opportunities that may be suitable for more than one of the companies. Also, conflicts may arise if there are issues or disputes under the commercial arrangements that exist between MSG or AMC Networks and us. In addition, certain of our directors and officers hold MSG and/or AMC Networks stock, performance stock units, restricted stock units, and/or or cash performance awards. These ownership interests could create actual, apparent or potential conflicts of interest when these individuals are faced with decisions that could have different implications for our Company and MSG or AMC Networks. See “Certain Relationships and Potential Conflicts of Interest” in our Proxy Statement filed with the SEC on October 27, 2017 and “Certain Relationships and Related Party Transactions — Certain Relationships and Potential Conflicts of Interest” in MSG’s registration statement on Form 10 filed with the SEC on September 11, 2015 for a discussion of certain procedures we instituted to help ameliorate such potential conflicts with MSG and/or AMC Networks that may arise. Our Overlapping Directors and Executive Officers With MSG and/or AMC Networks May Result in the Diversion of Corporate Opportunities and Other Conflicts to MSG and/or AMC Networks and Provisions in Our Amended and Restated Certificate of Incorporation May Provide Us No Remedy in That Circumstance. The Company acknowledges that directors and officers of the Company may also be serving as directors, officers, employees, consultants or agents of MSG and/or AMC Networks and their respective subsidiaries and that the Company may engage in material business transactions with such entities. The Company’s Board of Directors has adopted resolutions putting in place policies and arrangements whereby the Company has renounced its rights to certain business opportunities and no director or officer of the Company who is also serving as a director, officer, employee, consultant or agent of MSG and/or AMC Networks and their subsidiaries will be liable to the Company or its stockholders for breach of any fiduciary duty that would otherwise occur by reason of the fact that any such individual directs a corporate opportunity (other than certain limited types of opportunities set forth in such policies) to MSG and/or AMC Networks or any of their subsidiaries instead of the Company, or does not refer or communicate information regarding such corporate opportunities to the Company. We Could Have Significant Tax Liability as a Result of the Distribution. We have obtained an opinion from Sullivan & Cromwell LLP substantially to the effect that, among other things, the Distribution qualifies as a tax-free distribution under the Internal Revenue Code, (the “Code”). The opinion is not binding on the Internal Revenue Service (the “IRS”) or the courts. Additionally, we have received a private letter ruling from the IRS concluding that certain limited aspects of the Distribution will not prevent the Distribution from satisfying certain requirements for tax-free treatment under the Code. The opinion and the private letter ruling rely on factual representations and reasonable assumptions, which if incorrect or inaccurate may jeopardize the ability to rely on such opinion and letter ruling. If the Distribution does not qualify for tax-free treatment for U.S. federal income tax purposes, then, in general, we would be subject to tax as if we had sold the MSG common stock in a taxable sale for its fair value. MSG stockholders would be subject to tax as if they had received a distribution equal to the fair value of MSG common stock that was distributed to them, which generally would be treated first as a taxable dividend to the extent of our earnings and profits, then as a non-taxable return of capital to the extent of each holder’s tax basis in its MSG common stock, and thereafter as capital gain with respect to any remaining value. It is expected that the amount of any such taxes to MSG stockholders and us would be substantial. We Rely on MSG’s Performance Under Various Agreements. to liabilities arising out of the businesses we transferred to MSG. These agreements also include arrangements with respect to support services and a number of on-going commercial relationships, including our production and exhibition of Knicks and Rangers games, the sale of our advertising inventory by MSG and our use of the “MSG” brand. The advertising sales representation agreement, services agreement and trademark licensing agreement are each subject to potential termination by MSG in the event MSG and the Company are no longer affiliates. MSG provides certain business services that were performed by internal resources prior to the Distribution, such as information technology, accounts payable, payroll, tax, certain legal functions, human resources, insurance and risk management, investor relations, corporate communications, benefit plan administration and reporting, and internal audit functions. These services include the collection and storage of certain personal information regarding employees and/or customers as well as information regarding the Company and our Distributors and advertisers. See also “— We Face Continually Evolving Cybersecurity and Similar Risks, Which Could Result in the Disclosure of Confidential Information, Disruption of Our Business, Damage to Our Brands and Reputation, Legal Exposure and Financial Losses”. The services agreement expired on June 30, 2018. In connection with the expiration of the services agreement, the Company entered into an interim agreement with MSG, pursuant to which each party provides the other with the services described above on the same terms as provided in the services agreement on an interim basis while a new agreement is finalized. The media rights agreements provide us with the exclusive media rights to Knicks and Rangers games. Rights fees under these media rights agreements amounted to approximately $140.6 million for the year ended June 30, 2018. The rights fees increase annually and are subject to adjustments in certain circumstances, including if MSG does not make available a minimum number of games in any year. Our advertising sales representation agreement with MSG, which has a term through June 30, 2022, provides for MSG to act as our advertising sales representative and includes the exclusive right and obligation to sell certain advertising availabilities on our behalf for a commission. All of our advertising sales personnel were transferred to MSG in connection with the Distribution. As a result of this arrangement, we depend on MSG’s performance for the sale of our advertising. The advertising sales representation agreement is subject to certain termination rights, including MSG’s right to terminate if MSG and the Company are no longer affiliates and the Company’s right to terminate if certain sales thresholds are not met unless MSG elects to pay the Company the shortfall. The Company and MSG each rely on the other to perform its obligations under all of these agreements. If MSG were to breach, be unable to satisfy its material obligations under these agreements, including a failure to satisfy its indemnification or other financial obligations, or these agreements otherwise terminate or expire and we do not enter into replacement agreements, we could suffer operational difficulties and/or significant losses. Significant properties that are leased include approximately 64,000 square feet housing the Company’s administrative and executive offices and approximately 18,000 square feet of studio space in New York City. 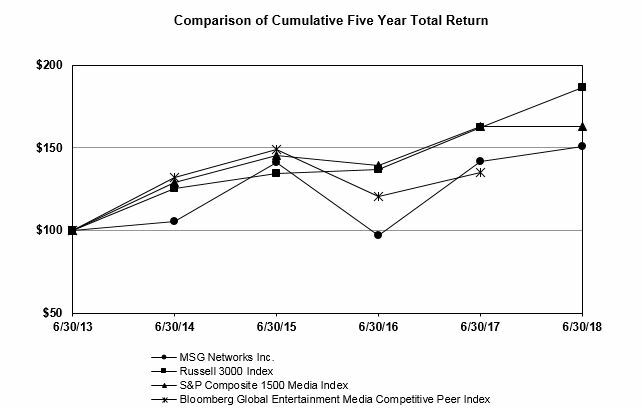 The following graph compares the cumulative total return of our Class A Common Stock for the last five years with the performance for the same period of the Russell 3000 Index and S&P Composite 1500 Media Index. The Bloomberg Global Entertainment Media Competitive Peer Index which was previously used by the Company was discontinued September 28, 2017. The comparison assumes an investment of $100 on June 30, 2013 and reinvestment of dividends. The Distribution is treated as a reinvestment of a special dividend pursuant to SEC rules. The stock price performance in this graph is not necessarily indicative of future stock performance. (a) The Bloomberg Global Entertainment Media Competitive Peer Index which was previously used by the Company was discontinued September 28, 2017. This performance graph shall not be deemed “filed” for purposes of Section 18 of the Exchange Act or incorporated by reference into any of our filings under the Securities Act of 1933, as amended, or the Exchange Act, except as expressly set forth by specific reference in such filing. As of June 30, 2018, there were 1,042 holders of record of our Class A Common Stock. There is no public trading market for our Class B Common Stock. As of June 30, 2018, there were 14 holders of record of our Class B Common Stock. We did not pay any dividend on our common stock during the 2018 and 2017 fiscal years and do not have any current plans to pay a cash dividend on our common stock for the foreseeable future. Our senior secured credit facilities restrict our ability to declare dividends in certain situations (see “Item 7. Management’s Discussion and Analysis of Financial Condition and Results of Operations — Liquidity and Capital Resources — Financing Agreements — Senior Secured Credit Facilities”). (a) On December 7, 2017, Company’s Board of Directors authorized the repurchase of up to $150,000 of the Company's Class A Common Stock. As of June 30, 2018, the Company had remaining authorization of $136,165 for future repurchases. Under the authorization, shares of Class A Common Stock may be purchased from time to time in open market or private transactions, in accordance with applicable insider trading and other securities laws and regulations, with the timing and amount of purchases depending on market conditions and other factors. The Company has been funding and expects to continue to fund stock repurchases through a combination of cash on hand and cash generated by operations. The Company may also choose to fund its stock repurchase program through other funding sources including utilizing its revolving credit facility. Total number of shares purchased are determined based on the settlement date of such trades. (b) The amounts do not give effect to any fees, commissions or other costs associated with repurchases of shares. the factors described under “Item 1A. Risk Factors” included in this Annual Report on Form 10-K.
We disclaim any obligation to update or revise the forward-looking statements contained herein, except as otherwise required by applicable federal securities laws. Following the Distribution, the Company operates and reports financial information in one segment. Business Overview. This section provides a general description of our business, as well as other matters that we believe are important in understanding our results of operations and financial condition and in anticipating future trends. Results of Operations. This section provides an analysis of our consolidated results of operations for the years ended June 30, 2018, 2017 and 2016. Liquidity and Capital Resources. This section provides a discussion of our financial condition and liquidity, as well as an analysis of our cash flows for the years ended June 30, 2018, 2017 and 2016. Recently Issued Accounting Pronouncements Not Yet Adopted and Critical Accounting Policies. This section provides a discussion of accounting policies considered to be important to our financial condition and results of operations and which require significant judgment and estimates on the part of management in their application. In addition, all of our significant accounting policies, including our critical accounting policies, are discussed in the notes to our consolidated financial statements included in Item 8 of this Annual Report on Form 10-K. The Company owns and operates two regional sports and entertainment networks, MSGN and MSG+. MSGN and MSG+ are home to 10 professional sports teams. We deliver live games of the New York Knicks (the “Knicks”) of the National Basketball Association (“NBA”); the New York Rangers (the “Rangers”), New York Islanders (the “Islanders”), New Jersey Devils (the “Devils”) and Buffalo Sabres (the “Sabres”) of the National Hockey League (“NHL”); the New York Liberty of the Women’s National Basketball Association; the New York Red Bulls of Major League Soccer, and the Westchester Knicks of the National Basketball Association G League. Additionally, we air programming relating to the New York Giants and Buffalo Bills of the National Football League. The Company earns revenues from two primary sources: affiliation fees and advertising. The Company earns affiliation fee revenue from distributors that carry our programming networks. The fees we receive depend largely on the demand from subscribers for our programming. Affiliation fee revenue constituted at least 90% of our consolidated revenues for each of the years ended June 30, 2018, 2017 and 2016. The Company primarily earns advertising revenue through the sale of commercial time to advertisers during our programming or through the sale of program sponsorship rights. The Company has an advertising sales representation agreement with MSG, which has a term through June 30, 2022, that provides for MSG to act as the Company’s advertising sales representative and includes the exclusive right and obligation to sell certain advertising availabilities on the Company’s behalf for a commission. The advertising sales representation agreement is subject to certain termination rights, including MSG’s right to terminate if MSG and the Company are no longer affiliates and the Company’s right to terminate if certain sales thresholds are not met unless MSG elects to pay the Company the shortfall. Direct operating expenses primarily include the cost of professional team rights acquired under media rights agreements to telecast various sporting events on our networks, and other direct programming and production costs of our networks. The Company has long-term media rights agreements with the Knicks, Rangers, Islanders, Devils and Sabres. The professional team media rights acquired under these agreements to telecast various sporting events and other programming for exhibition on our networks are typically expensed on a straight-line basis over the applicable annual contract or license period. We negotiate directly with the teams to determine the fee and other provisions of the media rights agreements. Media rights fees for sports programming are influenced by, among other things, the size and demographics of the geographic area in which the programming is distributed, and the popularity and/or the competitiveness of a team. In connection with the Distribution, the Company entered into media rights agreements with the Knicks and the Rangers, which provide the Company with exclusive media rights to the teams’ games in their local markets. These agreements were effective July 1, 2015. Prior to the Distribution Date, these rights fees were eliminated in consolidation; however the pre-Distribution Date amounts are now presented as revenues in the loss from discontinued operations line with the offsetting expense in direct operating expenses, within continuing operations, in the accompanying consolidated statement of operations for the year ended June 30, 2016. Other direct programming and production costs include, but are not limited to, the salaries of on-air personalities, producers, directors, technicians, writers and other creative staff, as well as expenses associated with location costs, remote facilities and maintaining studios, origination, and transmission facilities. Selling, general and administrative expenses primarily consist of administrative costs, including employee compensation and related benefits, professional fees, as well as sales commissions and advertising and marketing costs. Selling, general and administrative expenses for periods prior to the Distribution include certain corporate overhead expenses that did not meet the criteria for inclusion in discontinued operations. The financial performance of our business is affected by the affiliation agreements we negotiate with Distributors, the number of subscribers of certain Distributors, and also by the advertising rates we charge advertisers. Certain of these factors in turn depend on the popularity and/or performance of the professional sports teams carried on MSG Networks as well as the cost and the attractiveness of our programming content. Due largely to our long-term media rights agreements with our NBA and NHL teams and the generally recurring nature of our affiliation fee revenue, MSG Networks has consistently produced operating profits for a number of years. Advertising revenues are less predictable and can vary based upon a number of factors, including general economic conditions, team performance and the performance of MSG under our advertising sales representation agreement. Our Company’s future performance is also dependent on the U.S. and global economies, the impact of competition, and the relative strength of our current and future advertising customers. Instability and weakness of the U.S. and global economies and the negative effects on consumers’ and businesses’ discretionary spending may materially negatively affect our business and results of operations. See “Part I — Item 1. Business — Regulation” for other factors that may affect operating results. In the first quarter of fiscal year 2018, the Company adopted Accounting Standards Update (“ASU”) No. 2017-07, Compensation — Retirement Benefits (Topic 715): Improving the Presentation of Net Periodic Pension Cost and Net Periodic Postretirement Benefit Cost. See Note 2 to the consolidated financial statements included in Item 8 of this Annual Report on Form 10-K for more information. As this standard was applied retrospectively, the Company reclassified $1,633 of net periodic benefit cost from selling, general and administrative expenses and direct operating expenses to a separate line item within other income (expense) in the accompanying consolidated statement of operations for the year ended June 30, 2017. The increase in affiliation fee revenue was primarily due to higher affiliation rates, partially offset by the impact of a low single-digit percentage decrease in subscribers as compared with the prior year. The decrease in advertising revenue was due to lower playoff-related advertising sales, partially offset by other net advertising increases. Direct operating expenses for the year ended June 30, 2018 increased $19,963, or 7%, to $291,082 as compared with the prior year due to higher rights fees expense of $16,056 and, to a lesser extent, higher other programming-related cost increases of $3,907. The increase in rights fees expense primarily reflects annual contractual rate increases, a step-up in expense related to the renewal of a rights agreement with the Buffalo Sabres, and additional league fees related to streaming rights. The increase in other programming-related cost was primarily due to the absence of the positive impact of the finalization of a matter related to the sale of Fuse recorded in the prior year period, and other programming-related cost increases. Selling, general and administrative expenses for the year ended June 30, 2018 increased $4,033, or 5%, to $83,073 as compared with the prior year primarily due to higher employee compensation and related benefits (largely as a result of an increase in share-based compensation expense), partially offset by lower advertising and marketing costs and advertising sales commissions. Operating income for the year ended June 30, 2018 decreased $1,739, or 1%, to $313,158 as compared with the prior year period primarily due to (as discussed above) higher direct operating expenses and, to a lesser extent, higher selling, general and administrative expenses (including share-based compensation expense), largely offset by higher revenues and, to a lesser extent, lower depreciation and amortization. Interest expense for the year ended June 30, 2018 increased $3,204, or 8%, to $43,312 as compared with the prior year primarily due to higher average interest rates in fiscal year 2018 (3.0% as compared with 2.5%), partially offset by a lower average principal balance under the Company’s term loan facility (see “Financing Agreements — Senior Secured Credit Facilities”). Income tax benefit attributable to continuing operations for the year ended June 30, 2018 of $16,338 differs from the income tax expense derived from applying the 28% blended statutory federal rate to pretax income due principally to a deferred income tax benefit of $106,446 related to the reduction of the Company’s net deferred tax liabilities based upon the new federal rate. Other decreases included the impact of tax benefits related to the domestic production activities deduction of $3,585, tax return to book provision adjustments in connection with the finalizing of the Company's federal, state and local income tax returns of $3,411, state rate changes of $497, and other items of $241. These decreases were partially offset by the impact of the state and local income taxes (net of federal benefit) of $21,372. Income tax expense attributable to continuing operations for the year ended June 30, 2017 of $108,476 differs from the income tax expense derived from applying the 35% statutory federal rate to pretax income due principally to the impact of state and local income taxes (net of federal benefit) of $19,489, an increase in state tax rates used to re-measure the Company’s deferred taxes of $85, and other items of $548. These increases were partially offset by the impact of the tax benefits related to the domestic production activities deduction of $7,998, tax return to book provision adjustments in connection with the filing of the Company’s federal, state and local income tax returns of $208, and a tax benefit related to uncertain tax positions of $18. Adjusted operating income for the year ended June 30, 2018 increased $1,351 to $336,475 as compared with the prior year primarily due to (as discussed above) higher revenues, largely offset by higher direct operating expenses and, to a lesser extent, higher selling, general and administrative expenses (excluding share-based compensation expense). For the year ended June 30, 2016, the reported financial results of the Company reflect the fiscal 2016 first quarter results of the sports and entertainment businesses of MSG as discontinued operations. In addition, results from continuing operations for the first quarter of fiscal year 2016 include certain corporate overhead expenses that the Company did not incur during the year ended June 30, 2017 and does not expect to incur in future periods, but which did not meet the criteria for inclusion in discontinued operations. In the first quarter of fiscal year 2018, the Company adopted Accounting Standards Update (“ASU”) No. 2017-07, Compensation — Retirement Benefits (Topic 715): Improving the Presentation of Net Periodic Pension Cost and Net Periodic Postretirement Benefit Cost. See Note 2 to the consolidated financial statements included in Item 8 of this Annual Report on Form 10-K for more information. As this standard was applied retrospectively, the Company reclassified $1,633 and $2,044 of net periodic benefit cost from selling, general and administrative expenses and direct operating expenses to a separate line item within other income (expense) in the accompanying consolidated statements of operations for the years ended June 30, 2017 and 2016. The increase in affiliation fee revenue was primarily due to higher affiliation rates, partially offset by the impact of a low single-digit percentage decrease in subscribers as compared with the prior year and, to a lesser extent, the absence of the impact of a favorable affiliate adjustment recorded in the prior year. The increase in advertising revenue was primarily due to the favorable impact of a net decrease in deferred revenue related to ratings guarantees in the current year as compared with a net increase in deferred revenue in the prior year, and other net advertising increases partially offset by fewer live regular season professional sports telecasts. Direct operating expenses for the year ended June 30, 2017 increased $3,886, or 1%, to $271,119 as compared with the prior year due to higher rights fees expense of $7,599, partially offset by the positive impact of the finalization of a matter related to the sale of Fuse, and other programming-related cost decreases, totaling to $3,713. Selling, general and administrative expenses for the year ended June 30, 2017 decreased $21,712, or 22%, to $79,040 as compared with the prior year primarily due to the absence of certain corporate overhead expenses included in the results of the prior year period. As noted above, the fiscal year 2016 first quarter results include certain corporate expenses that the Company did not incur during the year ended June 30, 2017 and does not expect to incur in future periods. Partially offsetting this decrease are corporate costs which were incurred during fiscal year 2017 by MSG Networks Inc. as a standalone public company, including higher employee compensation and related benefits. Depreciation and amortization for the year ended June 30, 2017 decreased $4,287, or 29%, to $10,296 as compared with the prior year primarily due to the absence of depreciation expense included in the fiscal year 2016 first quarter results on certain corporate property and equipment that was transferred to MSG in connection with the Distribution, but which did not meet the criteria for inclusion in discontinued operations, as well as the impact of certain property and equipment being fully depreciated during fiscal year 2016. Operating income for the year ended June 30, 2017 increased $39,267, or 14%, to $314,897 as compared with the prior year primarily due to (as discussed above) lower selling, general and administrative expenses (including share-based compensation expense), higher revenues and, to a lesser extent, lower depreciation and amortization, partially offset by higher direct operating expenses. Interest expense for the year ended June 30, 2017 increased $8,425, or 27%, to $40,108 as compared with the prior year primarily due to higher interest expense incurred under the Company’s senior secured credit facilities with a syndicate of lenders (see “Financing Agreements — Senior Secured Credit Facilities”), which were entered into on September 28, 2015 and accordingly did not begin to accrue interest until that date, and other net increases. These other net increases primarily reflect higher interest rates in fiscal year 2017 period, partially offset by a lower average principal balance under the Term Loan Facility in fiscal year 2017 and the absence of the write-off of a portion of the deferred financing costs associated with the Company’s former credit facility recorded in the prior year. return for the tax year ended December 31, 2015. These decreases were partially offset by state and local income taxes of $17,709 (net of federal benefit), and other items of $84. Adjusted operating income for the year ended June 30, 2017 increased $35,645, or 12%, to $335,124 as compared with the prior year primarily due to (as discussed above) lower selling, general and administrative expenses (excluding share-based compensation expense) and higher revenues, partially offset by higher direct operating expenses. Our primary sources of liquidity are cash and cash equivalents, cash flows from the operations of our business and available borrowing capacity under our $250,000 revolving credit facility with a syndicate of lenders which was undrawn as of June 30, 2018 (see “Financing Agreements — Senior Secured Credit Facilities” below). Effective January 1, 2018, the Company expects that the recently enacted federal tax reform legislation will result in at least a 20% reduction of its future cash taxes payable on income from continuing operations before income taxes, as compared to amounts that would have otherwise been payable under the prior law. Our principal uses of cash are expected to include working capital-related items, capital spending, taxes, debt service, and repurchase of shares of the Company’s Class A Common Stock. The Company’s use of its available liquidity will be based upon the ongoing review of the funding needs of the business, the optimal allocation of cash resources, and the timing of cash flow generation. We believe we have sufficient liquidity, including $205,343 in cash and cash equivalents as of June 30, 2018, as well as the available borrowing capacity under our revolving credit facility and our anticipated operating cash flows, to fund our business operations, repurchase shares of the Company’s Class A Common Stock and service our outstanding term loan (see “Financing Agreements — Senior Secured Credit Facilities” below) over the next twelve months. However, potential subscriber reductions of our Distributors, changes in the demand for our programming, advertising revenue declines, our ability to maintain or obtain content, and other factors could adversely impact our business and results of operations, which might require that we seek alternative sources of funding through the capital and credit markets that may or may not be available to us. On December 7, 2017, the Company’s Board of Directors authorized the repurchase of up to $150,000 of the Company’s Class A Common Stock. Under the authorization, shares of Class A Common Stock may be purchased from time to time in open market or private transactions, block trades or such other manner as the Company may determine, in accordance with applicable insider trading and other securities laws and regulations. The timing and amount of purchases will depend on market conditions and other factors. As of June 30, 2018, the Company had $136,165 of availability remaining under its stock repurchase authorization. On September 28, 2015, MSGN Holdings L.P. (“MSGN L.P.”), an indirect wholly-owned subsidiary of the Company through which the Company conducts substantially all of its operations, and MSGN Eden, LLC, an indirect subsidiary of the Company and the general partner of MSGN L.P., Regional MSGN Holdings LLC, a direct subsidiary of the Company and the limited partner of MSGN L.P. (collectively with MSGN Eden, LLC, the “Holdings Entities”), and certain subsidiaries of MSGN L.P. entered into a credit agreement (the “Credit Agreement”) with a syndicate of lenders. The Credit Agreement provides MSGN L.P. with senior secured credit facilities (the “Senior Secured Credit Facilities”) consisting of: (a) an initial $1,550,000 term loan facility (the “Term Loan Facility”) and (b) a $250,000 revolving credit facility (the “Revolving Credit Facility”), each with a term of five years. In connection with the Distribution, $1,450,000 of the proceeds from the Term Loan Facility was contributed to MSG immediately following the closing of the Senior Secured Credit Facilities. The remainder of the proceeds from the Term Loan Facility were used by MSGN L.P. to pay for certain fees and expenses associated with the Distribution and the Senior Secured Credit Facilities and the balance was designated for use to fund working capital needs and other general corporate purposes of MSGN L.P. The Revolving Credit Facility was undrawn as of June 30, 2018 and is available to fund working capital needs and other general corporate purposes of MSGN L.P. Up to $35,000 of the Revolving Credit Facility is available for the issuance of letters of credit. Subject to the satisfaction of certain conditions and limitations, the Credit Agreement allows for the addition of incremental term and/or revolving loan commitments and incremental term and/or revolving loans. Company has made principal payments aggregating $353,750 through June 30, 2018. The Term Loan Facility amortizes quarterly in accordance with its terms through June 30, 2020 with a final maturity date on September 28, 2020. In addition to the financial covenants discussed above, the Credit Agreement and the related security agreement contain certain customary representations and warranties, affirmative covenants and events of default. The Credit Agreement contains certain restrictions on the ability of the Holdings Entities and MSGN L.P. and its restricted subsidiaries to take certain actions as provided in (and subject to various exceptions and baskets set forth in) the Credit Agreement, including the following: (i) incurring additional indebtedness and contingent liabilities; (ii) creating liens on certain assets; (iii) making investments, loans or advances in or to other persons; (iv) paying dividends and distributions or repurchasing capital stock; (v) changing their lines of business; (vi) engaging in certain transactions with affiliates; (vii) amending specified material agreements; (viii) merging or consolidating; (ix) making certain dispositions; and (x) entering into agreements that restrict the granting of liens. The Holdings Entities are also subject to customary passive holding company covenants. See Note 7 to the consolidated financial statements included in Item 8 of this Annual Report on Form 10-K for more information on the Credit Agreement. (a) Contractual obligations not reflected on the balance sheet consist primarily of the Company’s obligations under media rights agreements. (b) Operating lease obligations primarily represent future minimum rental payments on various long-term, noncancelable leases for office and studio space. (c) Consists of principal repayments required under the Company’s Term Loan Facility. Net cash provided by operating activities from continuing operations for the year ended June 30, 2018 increased by $13,452 to $210,610 as compared with the prior year. This increase was primarily due to lower income taxes paid and, to a lesser extent, other net increases, partially offset by lower income from continuing operations before income taxes as compared with the prior year period. Net cash provided by operating activities from continuing operations for the year ended June 30, 2017 increased by $15,310 to $197,158 as compared with the prior year. This increase was due to higher income from continuing operations before income taxes and, to a lesser extent, other net increases, partially offset by higher income taxes paid by continuing operations as compared with the prior year. Net cash used in operating activities of discontinued operations for fiscal year 2016 includes approximately $120,000 of income taxes paid. See Note 16 to the consolidated financial statements included in Item 8 of this Annual Report on Form 10-K.
Net cash used in investing activities from continuing operations for the year ended June 30, 2018 decreased by $1,170 to $3,724 as compared with the prior year due to lower capital expenditures in the current year period. Net cash used in investing activities from continuing operations for the year ended June 30, 2017 increased by $1,571 to $4,894 as compared with the prior year due to higher capital expenditures in the current year. Net cash used in financing activities from continuing operations for the year ended June 30, 2018 decreased by $27,139 to $142,630 as compared with the prior year. The decrease is due to lower principal repayments on the Company's Term Loan Facility, partially offset by an increase in cash used for current year repurchases on the Company’s Class A Common Stock, and to a lesser extent, higher taxes paid in lieu of shares issued for share-based compensation. The decrease in principal repayments on the Company’s Term Loan Facility is the result of lower voluntary payments, partially offset by higher contractual repayments as compared with the prior year. Net cash used in financing activities from continuing operations for the year ended June 30, 2017 increased by $76,228 to $169,769 as compared with the prior year. The main drivers of this change are higher principal repayments on the Company’s Term Loan Facility, including fiscal year 2017 voluntary payments of $100,000, as compared with the prior year, partially offset by the absence of the net impact of the following items which occurred in fiscal year 2016: (i) cash distributed with MSG in connection with the Distribution, (ii) cash used for repurchases of the Company’s Class A Common Stock under a share repurchase program which was terminated effective as of the Distribution Date, (iii) cash used for financing costs and (iv) the proceeds received from the Term Loan Facility. In May 2014, the Financial Accounting Standards Board (“FASB”) issued Accounting Standards Update (“ASU”) No. 2014-09, Revenue from Contracts with Customers (Topic 606), which supersedes the revenue recognition requirements in FASB Accounting Standards Codification (“ASC”) Topic 605, Revenue Recognition. This ASU is based on the principle that revenue is recognized to depict the transfer of goods or services to customers in an amount that reflects the consideration to which the entity expects to be entitled in exchange for those goods or services. The ASU also requires additional disclosure about the nature, amount, timing and uncertainty of revenue and cash flows arising from customer contracts, including significant judgments and changes in judgments and assets recognized from costs incurred to obtain or fulfill a contract. In August 2015, the FASB issued ASU No. 2015-14, Revenue from Contracts with Customers (Topic 606): Deferral of the Effective Date, which defers the effective date of ASU No. 2014-09 for all entities by one year. In March 2016, the FASB issued ASU No. 2016-08, Revenue from Contracts with Customers (Topic 606): Principal versus Agent Considerations, which provides clarification on the implementation guidance on principal versus agent considerations outlined in ASU No. 2014-09. In April 2016, the FASB issued ASU No. 2016-10, Revenue from Contracts with Customers (Topic 606): Identifying Performance Obligations and Licensing, which finalized amendments to identifying performance obligations and accounting for licenses of intellectual property. In May 2016, the FASB issued ASU No. 2016-12, Revenue from Contracts with Customers (Topic 606): Narrow-Scope Improvements and Practical Expedients, which clarifies assessing collectibility, noncash consideration, presentation of sales taxes, completed contracts and contract modifications at transition. The Company will adopt the standard in the first quarter of fiscal year 2019, using the modified retrospective approach. The Company has substantially completed its evaluation of the impact of the standard and does not expect the adoption to have a material impact on its consolidated revenues. Accordingly, the Company does not expect to record a material adjustment to opening accumulated deficit upon adoption. In February 2016, the FASB issued ASU No. 2016-02, Leases (Topic 842), which supersedes the current guidance in ASC Topic 840, Leases. This ASU requires the recognition of lease assets and lease liabilities on the balance sheet for those leases classified as operating leases under previous GAAP. The amended guidance also requires additional quantitative and qualitative disclosures regarding the amount, timing and uncertainty of cash flows arising from leases in order to provide additional information about the nature of an organization’s leasing activities. In July 2018, the FASB issued ASU No. 2018-10, Codification Improvements to Topic 842, Leases, which provides amendments and clarifications to ASU No. 2016-02 based on the FASB interaction with stakeholders. In July 2018, the FASB issued ASU No. 2018-11, Leases (Topic 842): Targeted Improvements, which amends Leases (Topic 842) to (i) add an optional transition method that would permit entities to apply the new requirements by recognizing a cumulative-effect adjustment to the opening balance of retained earnings in the year of adoption, and (ii) provide a practical expedient for lessors regarding the separation of the lease and non-lease components of a contract. This standard will be effective for the Company beginning in the first quarter of fiscal year 2020, with early adoption permitted. The Company is currently evaluating the impact this standard will have on its consolidated financial statements. fiscal year 2019 and requires the retrospective approach upon adoption. The adoption of this guidance is not expected to have a material impact on the Company’s consolidated financial statements. In January 2017, the FASB issued ASU No. 2017-01, Business Combinations (Topic 805): Clarifying the Definition of a Business, which clarifies the definition of a business with the objective of adding guidance to assist entities with evaluating whether transactions should be accounted for as acquisitions (or disposals) of assets or businesses, which will effect various areas of accounting including, but not limited to, goodwill and consolidation. This standard will be effective for the Company beginning in the first quarter of fiscal year 2019. The standard is to be applied prospectively. The adoption of this guidance is not expected to have a material impact on the Company’s consolidated financial statements. In January 2017, the FASB issued ASU No. 2017-04, Intangibles — Goodwill and Other (Topic 350): Simplifying the Test for Goodwill Impairment, which simplifies the measurement of goodwill impairment by eliminating the requirement of performing a hypothetical purchase price allocation. Instead, impairment will be measured using the difference between the carrying amount and fair value of the reporting unit. The amended guidance also eliminates the requirement for any reporting unit with a zero or a negative carrying amount to perform a qualitative assessment and will require disclosure of the amount of goodwill allocated to each reporting unit with a zero or a negative carrying amount of net assets. This standard will be effective for the Company beginning in the first quarter of fiscal year 2021, with early adoption permitted. The standard is to be applied prospectively. Based on the Company’s most recent annual goodwill impairment test completed in fiscal year 2018, the adoption of this guidance is not expected to have any initial impact on the Company’s consolidated financial statements. In May 2017, the FASB issued ASU No. 2017-09, Compensation — Stock Compensation (Topic 718): Scope of Modification Accounting, which provides clarification on when modification accounting should be used for changes to the terms or conditions of a share-based payment award. This standard does not change the accounting for modifications but clarifies that modification accounting guidance should only be applied if there is a change to the value, vesting conditions or award classification and would not be required if the changes are considered non-substantive. This standard will be effective for the Company beginning in the first quarter of fiscal year 2019. The standard is to be applied prospectively to an award modified on or after the adoption date. The adoption of this guidance is not expected to have a material impact on the Company's consolidated financial statements. In assessing the recoverability of the Company’s long-lived and indefinite-lived assets, the Company must make estimates and assumptions regarding future cash flows and other factors to determine the fair value of the respective assets. These estimates and assumptions could have a significant impact on whether an impairment charge is recognized and also the magnitude of any such charge. Fair value estimates are made at a specific point in time, based on relevant information. These estimates are subjective in nature and involve significant uncertainties and judgments and, therefore, cannot be determined with precision. Changes in assumptions could significantly affect the estimates. If these estimates or material related assumptions change in the future, the Company may be required to record impairment charges related to its long-lived and/or indefinite-lived assets. Relevant specific events such as changes in the carrying amount of net assets. During the first quarter of fiscal year 2018, the Company performed its annual impairment test of goodwill, and there was no impairment of goodwill identified. For other long-lived assets, including intangible assets that are amortized, the Company evaluates assets for recoverability when there is an indication of potential impairment. If the undiscounted cash flows from a group of assets being evaluated is less than the carrying value of that group of assets, the fair value of the asset group is determined and the carrying value of the asset group is written down to fair value. As of June 30, 2018, the Company’s intangible assets subject to amortization, which were affiliate relationships, have an estimated useful life of 24 years. The useful lives for the affiliate relationships were determined based upon an estimate for renewals of existing agreements the Company had in place with its major customers in April 2005 (the time that acquisition accounting was applied). The Company has renewed its major affiliation agreements and maintained customer relationships in the past and believes it will be able to renew its major affiliation agreements and maintain those customer relationships in the future. In light of these facts and circumstances, the Company has determined that its estimated useful lives are appropriate. However, it is possible that the Company will not successfully renew such agreements as they expire or that if it does, the net revenue earned may not equal or exceed the net revenue currently being earned, which could have a material negative effect on our business. If a Distributor ceases to carry the service on an other than temporary basis, the Company would record an impairment charge for the then remaining carrying value of the affiliate relationship intangible asset associated with that Distributor. If the Company were to renew an affiliation agreement at rates that produced materially less net revenue compared to the net revenue produced under the previous agreement, the Company would evaluate the impact on its cash flows and, if necessary, would further evaluate such indication of potential impairment by following the policy described above for the asset or asset group containing that intangible asset. The Company also would evaluate whether the remaining useful life of the affiliate relationship remained appropriate. Based on the carrying value of the affiliate relationships recorded as of June 30, 2018, if the estimated life of these affiliate relationships were shortened by 10%, the effect on amortization for the year ended June 30, 2018 would be an increase of approximately $384. Company’s funded pension plan, the expected long-term rate of return on plan assets, are important elements of the plans’ expense and liability measurement and we evaluate these key assumptions annually. Other assumptions include demographic factors, such as mortality, retirement age and turnover. The actuarial assumptions used by the Company may differ materially from actual results due to various factors, including, but not limited to, changing economic and market conditions. Differences between actual and expected occurrences could significantly impact the actual amount of net periodic benefit cost and the benefit obligation recorded by the Company. Material changes in the costs of the plans may occur in the future due to changes in these assumptions, changes in the number of the plan participants, changes in the level of benefits provided, changes in asset levels and changes in legislation. Our assumptions reflect our historical experience and our best judgment regarding future expectations. Accumulated and projected benefit obligations reflect the present value of future cash payments for benefits. We use the Willis Towers Watson U.S. Rate Link: 40-90 discount rate model (which is developed by examining the yields on selected highly rated corporate bonds) to discount these benefit payments on a plan by plan basis, to select the rates at which we believe each plan’s benefits could be effectively settled. Lower discount rates increase the present value of benefit obligations and will usually increase the subsequent year’s net periodic benefit cost. The weighted-average discount rates used to determine benefit obligations as of June 30, 2018 for the Company’s pension plans and postretirement plan were 4.20% and 4.14%, respectively. A 25 basis point decrease in these assumed discount rates would increase the projected benefit obligations for the Company’s pension plans and postretirement plan at June 30, 2018 by $1,330 and $111, respectively. The weighted-average discount rates used to determine the service cost and interest cost components of net periodic benefit cost for the year ended June 30, 2018 for the Company’s pension plans were 3.92% and 3.35%, respectively. The weighted-average discount rates used to determine the service cost and interest cost components of net periodic benefit cost for the year ended June 30, 2018 for the Company’s postretirement plan were 3.90% and 3.25%, respectively. A 25 basis point decrease in these assumed discount rates would increase the total net periodic benefit cost for the Company’s pension plans by $90 and decrease net periodic benefit cost for the postretirement plan by $4 for the year ended June 30, 2018. The expected long-term rate of return on plan assets is based on a periodic review and modeling of the plan’s asset allocation structures over a long-term horizon. Expectations of returns for each asset class are the most important of the assumptions used in the review and modeling, and are based on comprehensive reviews of historical data, forward-looking economic outlook, and economic/financial market theory. The expected long-term rate of return was selected from within the reasonable range of rates determined by (a) historical real returns, net of inflation, for the asset classes covered by the investment policy, and (b) projections of inflation over the long-term period during which benefits are payable to plan participants. The expected long-term rate of return on plan assets for the Company’s funded pension plans was 3.46% for the year ended June 30, 2018. Performance of the capital markets affects the value of assets that are held in trust to satisfy future obligations under the Company’s funded plans. Adverse market performance in the future could result in lower rates of return for these assets than projected by the Company which could increase the Company’s funding requirements related to these plans, as well as negatively affect the Company’s operating results by increasing the net periodic benefit cost. A 25 basis point decrease in the long-term rate of return on pension plan assets assumption would increase net periodic pension benefit cost by $41 for the year ended June 30, 2018. Another important assumption for our postretirement plan is healthcare cost trend rates. We developed our estimate of the healthcare cost trend rates through examination of the Company’s claims experience and the results of recent healthcare trend surveys. GAAP includes mechanisms that serve to limit the volatility in the Company’s earnings that otherwise would result from recording changes in the value of plan assets and benefit obligations in our consolidated financial statements in the periods in which those changes occur. For example, while the expected long-term rate of return on the plan’s assets should, over time, approximate the actual long-term returns, differences between the expected and actual returns could occur in any given year. These differences contribute to the deferred actuarial gains or losses, which are then amortized over time. See Note 12 to the consolidated financial statements included in Item 8 of this Annual Report on Form 10-K for more information on our pension plans and other postretirement benefit plan. For sensitivity analyses and other information regarding market risks we face in connection with our pension and postretirement plans, see “Item 7. Management’s Discussion and Analysis of Financial Condition and Results of Operations —Recently Issued Accounting Pronouncements Not Yet Adopted and Critical Accounting Policies — Critical Accounting Policies — Defined Benefit Pension Plans and Other Postretirement Benefit Plan,” which information is incorporated by reference herein. Our market risk exposure to interest rate risk relates to any borrowing we may incur. Borrowings under the credit agreement, dated September 28, 2015, among MSGN L.P., MSGN Eden, LLC, Regional MSGN Holdings LLC and certain subsidiaries of MSGN L.P. and a syndicate of lenders (the “Credit Agreement”) bear interest, based on our election, at a floating rate based upon LIBOR, the New York Fed Bank Rate or the U.S. Prime Rate, plus, in each case, an additional rate which is fixed for an initial period of time and thereafter dependent upon our total leverage ratio at the time. Accordingly, we are subject to interest rate risk with respect to the tenor of any borrowings we may incur under the Credit Agreement. The effect of a hypothetical 100 basis point increase in floating interest rates prevailing at June 30, 2018 and continuing for a full year would increase interest expense related to the amount outstanding under our $1.550 billion term loan facility provided under the Credit Agreement by $11,394. If appropriate, we may seek to reduce such exposure through the use of interest rate swaps or similar instruments. See “Item 7. Management’s Discussion and Analysis of Financial Condition and Results of Operations — Liquidity and Capital Resources — Financing Agreements” for more information on our Credit Agreement. We have de minimis foreign currency risk exposure as our business operates almost entirely in U.S. Dollars. We do not have any meaningful commodity risk exposures associated with our operations. The Financial Statements required by this Item 8 appear beginning on page F-1 of this Annual Report on Form 10-K, and are incorporated by reference herein. An evaluation was carried out under the supervision and with the participation of the Company’s management, including our Chief Executive Officer and Chief Financial Officer, of the effectiveness of the design and operation of our disclosure controls and procedures (as defined in Rules 13a-15(e) and 15d-15(e) under the Exchange Act) as of the end of the period covered by this report. Based upon that evaluation, the Company’s Chief Executive Officer and Chief Financial Officer concluded that as of June 30, 2018 the Company’s disclosure controls and procedures were effective. Management is responsible for establishing and maintaining adequate internal control over financial reporting, as such term is defined in Rule 13a-15(f) under the Exchange Act. The Company’s internal control over financial reporting includes those policies and procedures that: (i) pertain to the maintenance of records that, in reasonable detail, accurately and fairly reflect the transactions and dispositions of the assets of the Company, (ii) provide reasonable assurance that transactions are recorded as necessary to permit preparation of financial statements in accordance with generally accepted accounting principles, and that receipts and expenditures of the Company are being made only in accordance with authorizations of management and directors of the Company, and (iii) provide reasonable assurance regarding prevention or timely detection of unauthorized acquisition, use, or disposition of the Company’s assets that could have a material effect on the financial statements. Internal control over financial reporting is designed to provide reasonable assurance regarding the reliability of financial reporting and the preparation of financial statements prepared for external purposes in accordance with generally accepted accounting principles. Because of its inherent limitations, internal control over financial reporting may not prevent or detect misstatements. Also, projections of any evaluation of effectiveness to future periods are subject to the risk that controls may become inadequate because of changes in conditions, or that the degree of compliance with the policies or procedures may deteriorate. Under the supervision and with the participation of management, including the Company’s Chief Executive Officer and Chief Financial Officer, the Company conducted an evaluation of the effectiveness of our internal control over financial reporting based on the framework in Internal Control — Integrated Framework (2013) issued by the Committee of Sponsoring Organizations of the Treadway Commission. Based on the results of this evaluation, our management concluded that our internal control over financial reporting was effective as of June 30, 2018. The effectiveness of our internal control over financial reporting as of June 30, 2018 has been audited by KPMG LLP, an independent registered public accounting firm, as stated in their report which is included herein. There were no changes in the Company’s internal control over financial reporting (as such term is defined in Rules 13a-15(f) and 15d-15(f) under the Exchange Act) during the fiscal quarter ended June 30, 2018 that have materially affected, or are reasonably likely to materially affect, the Company’s internal control over financial reporting. Information relating to our directors, executive officers and corporate governance will be included in the proxy statement for the 2018 annual meeting of the Company’s stockholders, which is expected to be filed within 120 days of our fiscal year end, and is incorporated herein by reference. Information relating to executive compensation will be included in the proxy statement for the 2018 annual meeting of the Company’s stockholders, which is expected to be filed within 120 days of our fiscal year end, and is incorporated herein by reference. Information relating to the beneficial ownership of our common stock will be included in the proxy statement for the 2018 annual meeting of the Company’s stockholders, which is expected to be filed within 120 days of our fiscal year end, and is incorporated herein by reference. Information relating to certain relationships and related transactions and director independence will be included in the proxy statement for the 2018 annual meeting of the Company’s stockholders, which is expected to be filed within 120 days of our fiscal year end, and is incorporated herein by reference. Information relating to principal accountant fees and services will be included in the proxy statement for the 2018 annual meeting of the Company’s stockholders, which is expected to be filed within 120 days of our fiscal year end, and is incorporated herein by reference. Schedules other than that listed above have been omitted, since they are either not applicable, not required or the information is included elsewhere herein. Distribution Agreement dated September 11, 2015, between MSG Networks Inc. and The Madison Square Garden Company (incorporated by reference to Exhibit 99.1 to the Company’s Current Report on Form 8-K filed September 14, 2015). Amended and Restated Certificate of Incorporation of Madison Square Garden, Inc. (incorporated by reference to Exhibit 99.1 to the Company's Current Report on Form 8-K filed on February 10, 2010). Certificate of Ownership and Merger merging The Madison Square Garden Company with and into Madison Square Garden, Inc. (incorporated by reference to Exhibit 3.1 to the Company's Form 10-Q for the quarter ended March 31, 2011 filed on May 6, 2011). Amendment to the Amended and Restated Certificate of Incorporation of MSG Networks Inc., (incorporated by reference to Exhibit 3.1 to the Company’s Current Report on Form 8-K filed on October 6, 2015). Amended By-Laws of MSG Networks Inc. (incorporated by reference to Exhibit 3.2 to the Company's Current Report on Form 8-K filed on October 6, 2015). Registration Rights Agreement by and among MSG Networks Inc. formerly known as The Madison Square Garden Company and the Charles F. Dolan Children Trusts (incorporated by reference to Exhibit 3.5 to Amendment No. 7 to the Company's Registration Statement on Form 10 filed on January 14, 2010). Registration Rights Agreement by and among MSG Networks Inc. formerly known as The Madison Square Garden Company and the Dolan Family Affiliates (incorporated by reference to Exhibit 3.6 to Amendment No. 7 to the Company's Registration Statement on Form 10 filed on January 14, 2010). Transfer Consent Agreement with NBA, dated February 9, 2010 (incorporated by reference to Exhibit 3.7 to Amendment No. 6 to the Company's Registration Statement on Form 10 filed on January 11, 2010). Transfer Consent Agreement with NHL, dated February 9, 2010 (incorporated by reference to Exhibit 3.8 to Amendment No. 6 to the Company's Registration Statement on Form 10 filed on January 11, 2010). Tax Disaffiliation Agreement dated September 11, 2015, between MSG Networks Inc. and The Madison Square Garden Company (incorporated by reference to Exhibit 99.4 to the Company’s Current Report on Form 8-K filed on September 14, 2015). Contribution Agreement, dated as of September 11, 2015, among MSG Networks Inc., MSGN Holdings, L.P. and The Madison Square Garden Company (incorporated by reference to Exhibit 99.2 to the Company’s Current Report on Form 8-K filed on September 14, 2015). Transition Services Agreement dated as of September 11, 2015, between MSG Networks Inc. and The Madison Square Garden Company (incorporated by reference to Exhibit 99.3 to the Company’s Current Report on Form 8-K filed on September 14, 2015). Employee Matters Agreement dated September 11, 2015, between MSG Networks Inc. and The Madison Square Garden Company (incorporated by reference to Exhibit 99.5 to the Company’s Current Report on Form 8-K filed on September 14, 2015). Credit Agreement dated as of September 28, 2015, by and among MSGN Holdings, L.P., certain subsidiaries of MSGN Holdings, L.P. identified therein, MSGN Eden, LLC, MSGN Regional Holdings LLC and JPMorgan Chase Bank, N.A., as administrative agent, collateral agent and a letter of credit issuer, and the lenders party thereto (incorporated by reference to Exhibit 10.1 to the Company’s Current Report on Form 8-K filed on September 28, 2015). Security Agreement dated as of September 28, 2015, by and among MSGN Holdings, L.P., certain subsidiaries of MSGN Holdings, L.P. identified therein, MSGN Eden, LLC, MSGN Regional Holdings LLC, and JPMorgan Chase Bank, N.A., as collateral agent thereto (incorporated by reference to Exhibit 10.2 to the Company’s Current Report on Form 8-K filed on September 28, 2015). MSG Networks Inc. Policy Concerning Certain Matters Relating to The Madison Square Garden Company and AMC Networks Inc. including Responsibilities of Overlapping Directors and Officers (incorporated by reference to Exhibit 10.1 to the Company’s Form 10-Q for the quarter ended September 30, 2015 filed on November 5, 2015). Summary of Office Space Arrangement between the Company and the Dolan Family Office (incorporated by reference to Exhibit 10.56 to the Company’s Form 10-K for the fiscal year ended June 30, 2016 filed on August 18, 2016). Subsidiaries of the Registrant (incorporated by reference to Exhibit 21.1 to the Company’s Form 10-K for the fiscal year ended June 30, 2017 filed on August 16, 2017). Powers of Attorney (included on the signature page to this Annual Report on Form 10-K). Certification by the President and Chief Executive Officer Pursuant to Section 302 of the Sarbanes-Oxley Act of 2002. Certification by the President and Chief Executive Officer Pursuant to Section 906 of the Sarbanes-Oxley Act of 2002. The Company has elected not to provide a summary. (a) Primarily reflects write-offs of uncollectible amounts. Pursuant to the requirements of Section 13 or 15(d) the Securities Exchange Act of 1934, as amended, the Registrant has duly caused this report to be signed on its behalf by the undersigned, thereunto duly authorized, on the 15th day of August, 2018. KNOW ALL MEN BY THESE PRESENTS, that each person whose signature appears below constitutes and appoints Andrea Greenberg and Bret Richter, and each of them, as such person's true and lawful attorneys-in-fact and agents, with full power of substitution and resubstitution, for such person in such person's name, place and stead, in any and all capacities, to sign this report, and file the same, with all exhibits thereto, and other documents in connection therewith, with the Securities and Exchange Commission, granting unto said attorneys-in-fact and agents, full power and authority to do and perform each and every act and thing requisite and necessary to be done as fully to all intents and purposes as he might or could do in person, hereby ratifying and confirming all that said attorneys-in-fact and agents or any of them may lawfully do or cause to be done by virtue hereof. We have audited the accompanying consolidated balance sheets of MSG Networks Inc. and subsidiaries (the Company) as of June 30, 2018 and 2017, the related consolidated statements of operations, comprehensive income, stockholders’ deficiency, and cash flows for each of the years in the three-year period ended June 30, 2018, and the related notes and financial statement schedule II, collectively, the consolidated financial statements. In our opinion, the consolidated financial statements present fairly, in all material respects, the financial position of the Company as of June 30, 2018 and 2017, and the results of its operations and its cash flows for each of the years in the three-year period ended June 30, 2018, in conformity with U.S. generally accepted accounting principles. We also have audited, in accordance with the standards of the Public Company Accounting Oversight Board (United States) (PCAOB), the Company’s internal control over financial reporting as of June 30, 2018, based on criteria established in Internal Control - Integrated Framework (2013) issued by the Committee of Sponsoring Organizations of the Treadway Commission, and our report dated August 15, 2018 expressed an unqualified opinion on the effectiveness of the Company’s internal control over financial reporting. We have audited MSG Networks Inc. and subsidiaries (the Company) internal control over financial reporting as of June 30, 2018, based on criteria established in Internal Control - Integrated Framework (2013) issued by the Committee of Sponsoring Organizations of the Treadway Commission. In our opinion, the Company maintained, in all material respects, effective internal control over financial reporting as of June 30, 2018, based on criteria established in Internal Control - Integrated Framework (2013) issued by the Committee of Sponsoring Organizations of the Treadway Commission. We also have audited, in accordance with the standards of the Public Company Accounting Oversight Board (United States) (PCAOB), the consolidated balance sheets of the Company as of June 30, 2018 and 2017, the related consolidated statements of operations, comprehensive income, stockholders’ deficiency, and cash flows for each of the years in the three-year period ended June 30, 2018, the related notes and financial statement Schedule II - Valuation and Qualifying accounts, collectively, the consolidated financial statements, and our report dated August 15, 2018 expressed an unqualified opinion on those consolidated financial statements.